After months of leaks and rumours, Google has finally taken the wraps off its latest flagship smartphones, the Pixel 3 and Pixel 3 XL, at its annual Made By Google event. The refreshed handsets boast bigger displays and smaller bezels than last year, there's also an improved Portrait Mode for bokeh-style background blur, better quality images in low-light, and a wide-angle front-facing camera, so you should never need to use a selfie stick ever again. T3.com was in the crowd at the latest Made By Google keynote, which saw the launch of a new Pixel Slate tablet, as well as a touchscreen Home Hub. We also got our paws on the Pixel 3 and Pixel 3 XL for an early verdict review. Like the previous two iterations of the Pixel, Google has unveiled two different sizes for its new handset. The regular Pixel 3 sports a 5.5-inch FHD+ OLED display bookended by thin, curved bezels identical to those found on the Pixel 2 XL last year. Meanwhile, Pixel 3 XL has a larger 6.3-inch FHD+ OLED notched display, marking another step towards omnipresence for the screen design that was the target of a certain amount of ire when it first appeared on the iPhone X last year. The notch – a deep cut-out at the top of the all-screen design to house the front-facing camera, speaker, and a slew of sensors – enables Google to achieve a higher screen-to-body ratio than it managed with its previous XL model. Both Pixel 3 and Pixel 3 XL boast Always-on display technology with a 100,000:1 contrast ratio and support for HDR (High Dynamic Range) content. Both devices are protected with Corning Gorilla Glass 5 on the front and back, which has allowed Google to add support for Qi wireless charging – a first for the range. Aside from the new screen sizes, the Pixel 3 and Pixel 3 XL look remarkably similar to their predecessors, Pixel 2 and Pixel 2 XL. On the back of both new handsets, you'll find the same single-lens rear camera, circular fingerprint reader, and two-tone case. While the new industrial design isn't much of a departure from last year, things have been beefed up on the inside. Pixel 3 and Pixel 3 XL are powered by a Snapdragon 845 processor – that's the same top-of-the-line silicon used in every other Android flagship launched so far year, coupled with 4GB of RAM. 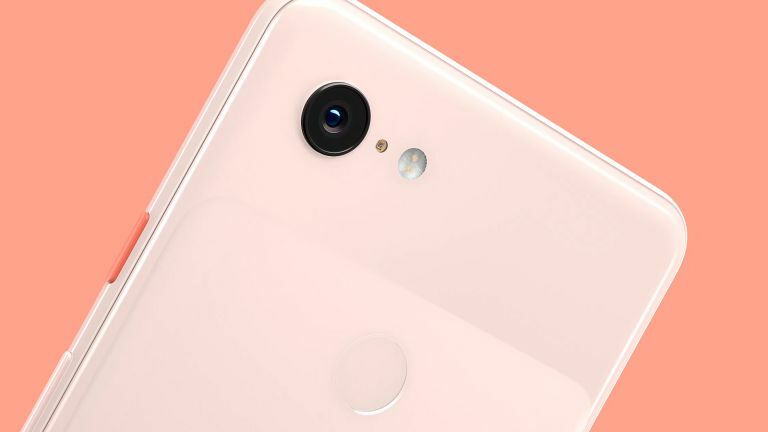 In terms of camera system, Google Pixel 3 and Pixel 3 XL also feature a redesigned HDR+ shooting technology to enhance photos taken in low-light conditions. There's also an AI-powered Top Shot function that takes a series of pictures in the background every time you press the shutter button and suggests the best-looking snap. Google says the feature should put an end to those unsalvageable shots where one of your group is blinking. If you're a fan of the squeezable mechanism found on last year's Pixels, you'll be pleased to know it's making a comeback. Dubbed Active Edge, the feature lets users press-in the frame of the phone to launch the Google Assistant. Both flagship handsets will ship with the latest version of Google's mobile OS, Android 9.0 Pie, as well as IPX8 water and dust resistance. Like the Pixel Slate tablet also unveiled during the latest Made By Google keynote, the Pixel 3 and Pixel 3 XL include a designated Titan M security chip, which Google says ensures your information, device passwords and operating system are all encrypted and stored on your Pixel Slate – not in the cloud. Google dropped the 3.5mm headphone port last year, so its no surprise that it's still M.I.A in the new Pixel 3 and Pixel 3 XL. As a result, charging and audio will be handled by the USB-C port. Thankfully, Google will include wired USB-C headphones in the box with the smartphone this year – a welcome addition. For those who've shelled-out on a nice pair of wired headphones, Google will also include a USB-C to 3.5mm jack adapter in the box, too. Google has included some new colour options to go with its new Pixel devices. Gone are the 'Kinda Blue' and 'Black & White' finishes from last year, replaced instead with ‘Just Black’, ‘Clearly White’ and ‘Not Pink’ – a subtle, pinkish sand-like colour.